What is Heart Energy and How Can You Benefit From It? Home » Heart Energy » What is Heart Energy? Heart energy is a simple, welcoming, loving, all giving, all receiving, type of energy. It is a very broadband vibrational energy. It is a very easy energy for people to pick up on, to grasp, and to understand because it is that love element that so many understand, know about, and want to have. It makes you feel good when you have love-filled energy and that peacefulness that comes with loving. This loving can be on any object or thing that you desire. Is chi the same thing as heart energy? Chi energy is unlike heart energy. Chi is a hotter energy. It is what moves your body to perform the actions that it needs to do. It keeps your body functioning. While it does have the ability to surround your body and is a part of all things, it is a different type of energy, no less or no more than heart energy, just different. Heart energy, on the other hand, keeps your body flowing. It is a more loving type energy that moves and surrounds your body in a loving envelope, in a bubble of heartfelt joyful passion. 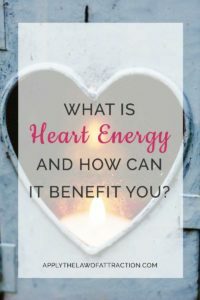 What are the benefits of using heart energy? Opening up to the Universe is always one benefit. It allows the joyous feeling of passion and love for all things to move in you. It will also bring healing of those areas within your body where you may not even know there is a problem. You can move past any of the pain and suffering that might be there and actually become healed such that you can strive forth and move at a quicker pace and move at a much more luxurious and loving pace. If the energy of the heart is opened up, it will bring you peace and enlightenment. If more people can expand heart energy now, bringing more of it into their lives and into their body, then more and more people will be touched by it. More and more people will feel this goodness, be open to it, and express the goodness inside them. The more people that are expressing this goodness, the more goodness there is to spread from place to place. There will be fewer enemies, fewer wars, and fewer things that will cause people to be stressed, to hurt, or to have pain and suffering. As more people use this loving energy, it will bring more peace and love onto the planet.